Erin Murphy Literary Agency is a leading U.S. children's book agency headquartered in southern Maine. We focus on connections—between writer and editor, story and reader—as well as on helping our clients build their careers and grow as artists. Brian doesn’t do anything halfway, as you can see—and as evidenced by that shiny silver sticker recently added to the cover of THE ROUGH PATCH. He does dozens of school visits a year, which get raves, of course, and this is in no small part because he really pays attention to his audience—kids. 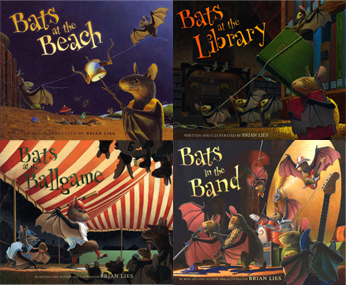 Kate O’Sullivan at HMH has signed the first two books in Caldecott Honor illustrator Brian Lies's young picture book series LITTLE BAT, spun off of his bestselling BATS books (BATS AT THE LIBRARY, BATS AT THE BEACH, etc. ), starting with NIGHT SCHOOL in spring 2021. Erin Murphy of Erin Murphy Literary Agency brokered the deal for world rights. Huge congratulations, Brian! Can’t wait to see this series launch!